2017 9th Annual brothers HABET Table Tennis Team League concludes! 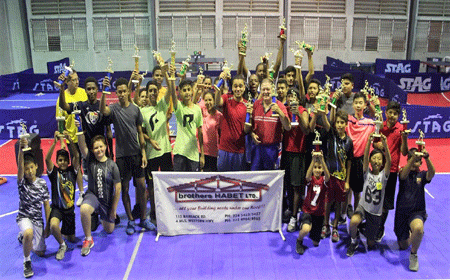 BELIZE CITY, Tues. Nov. 21, 2017–The 2017 9th Annual brothers HABET Team League concluded this past weekend, November 18 & 19, after 7 weeks of intense competition. This year saw participation from over 60 players and 17 teams, making this our largest team tournament to date. Division 1: Hurricane defeated Racqueteers, 3-1. Division 3: Cho Le Cho def. SJC Wildcats, 3-1; Smashers def. VAV, 2-0. The top four teams in each division then proceeded to play on Sunday, November 19. Division 1: 1st Place – Rasanter (Devesh Hukmani, Rohit Pagarani, Jofny Paguaga); 2nd Place – Crushers 3.0 (Latrell Solis, Taye Parkinson, Jaylen Nicholson); 3rd Place – Hurricane (Terry Su, Kelly Liu, Carlos Cui); 3rd Place – Strikers (Kevin Chen, Amiri Hoare, Manuel Castellanos). Division 2: 1st Place – Phoenix (Francis Gegg, Joshua Gegg, Moses Babb, Jorge Espat); 2nd Place – Lightning (Mihir Karnani, Daryl Palacio, Jai Chawla); 3rd Place – Dominators (Abigail Thurton, Samuel Ferguson, Sarai Paguaga); 3rd Place – Topspinners (Gabrielle Gabourel, Goran Gabourel, Denzel Young). Division 3: 1st Place – Cho Le Cho (Parin Thadani, Che Waight, Andrew Jaramillo); 2nd Place – Smashers (Huang Yo Yang, Colin Wu, Ray Wu); 3rd Place – VAV (Varun Sadarangani, Aryun Chugani, Viniyak Vanjani); 3rd Place – Li Maa (Hirthik Bhojwani, Mohit Vanjani, Sergio Pech).